Between the hours of 8:30am and 5pm, Monday to Friday, I work as an influencer marketing manager. Without sounding too reductionist, one area of my job involves setting up brand collaborations between e-commerce fashion brands and bloggers. 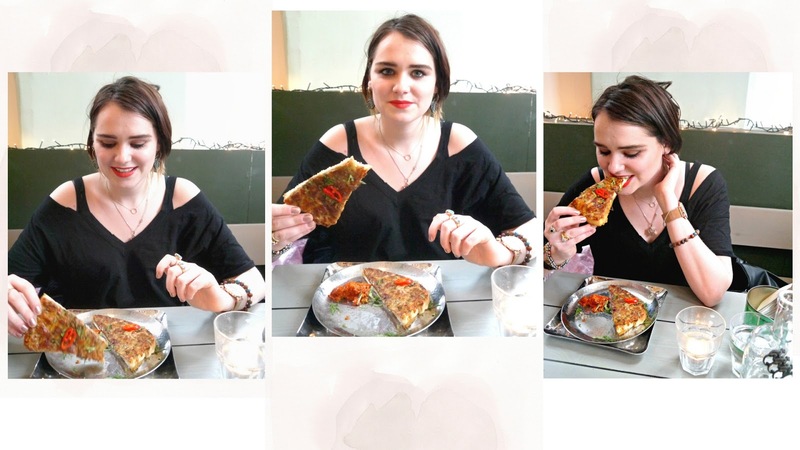 Then, on my lunch break i'm often found perusing my favourite style blogs such as shotfromthestreet or meganellaby - It's safe to say i'm nearly always surrounded by fashion blogger content. It's always interested me how i've never felt confident enough to document more of myself and my style over here on Good Golly Miss Hollie. As you can imagine, when the opportunity to collaborate with a brand came up for me personally, I was terrified! I spend my days setting these kind of collabs going for other people - why was I so scared now that I would actually be standing in front of the camera? There was only one thing to do, engage my longtime friend Laura of the travel and lifestyle blog, Wander with Laura to help me feel at ease doing something i've always wanted to do, but always felt too unstylish, too fat or too ugly. 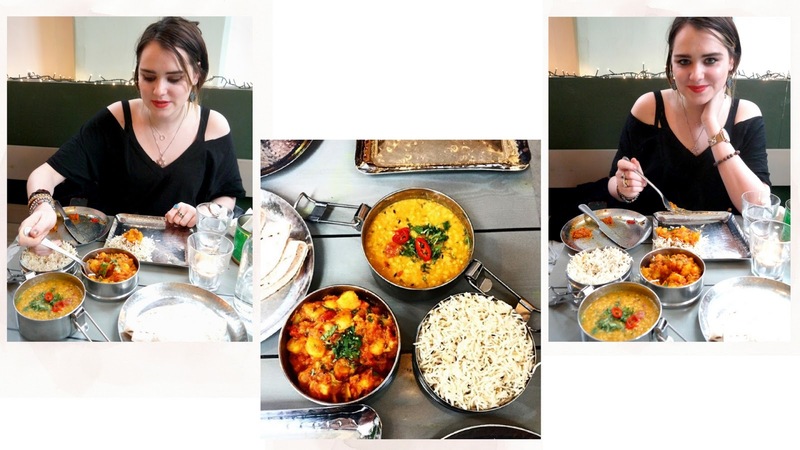 Before heading out to take some snaps, we headed to Mowgli, Liverpool for a bite of fresh, Indian home cooking. I highly recommend! 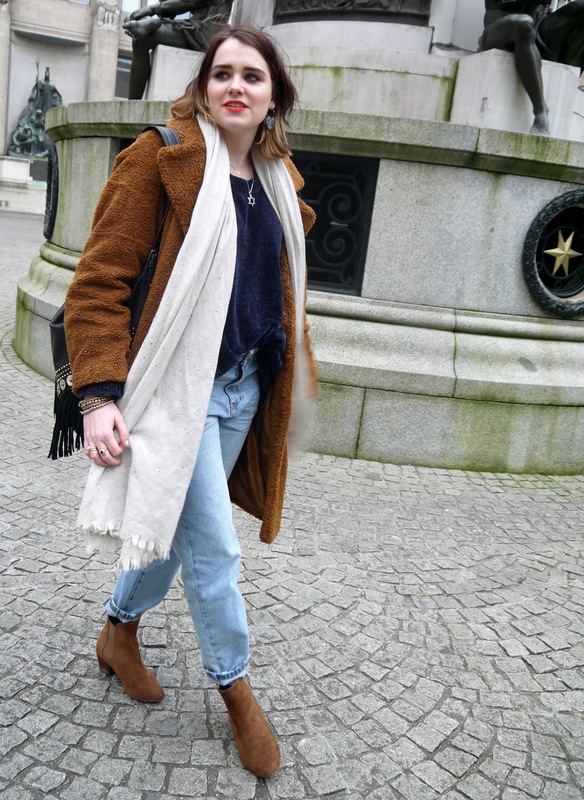 I honestly have so much respect for those bloggers heading out to snap their outfits on a regular basis, not only was I feeling MAJORLY self conscious as people passed by with disconcerting looks, I didn't know what to do with my face, with my hands, with my feet! And there were so. many. questions...Is my hair ok? Are my necklaces the right way around, are my socks showing? Why is it sooooo freezing cold?! Once i'd got into the swing of things, I started to relax a little. Who cares if someones watching? I'm likely to never see them ever again. 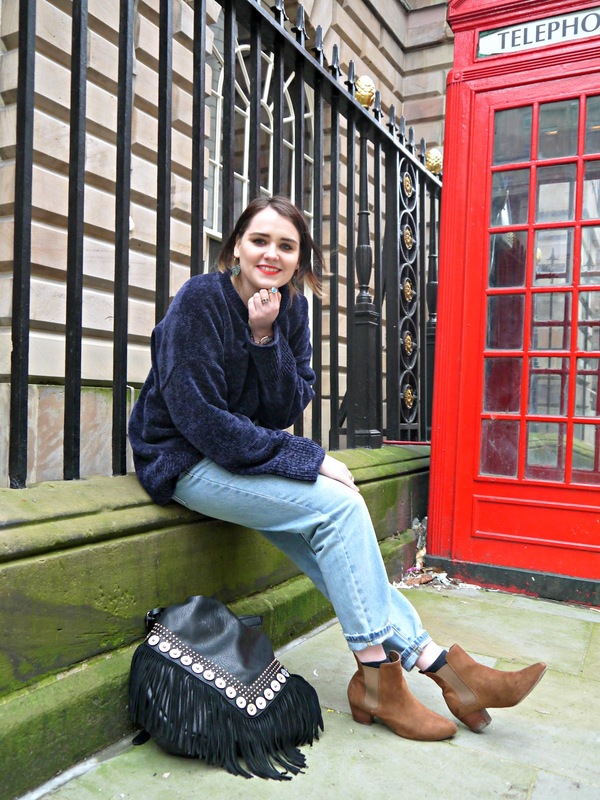 And now i've eased myself into the water of this style capturing lark, I can share with you the outfit that i've been calling upon time and time again whether it's a lazy Sunday, or a day in the office. 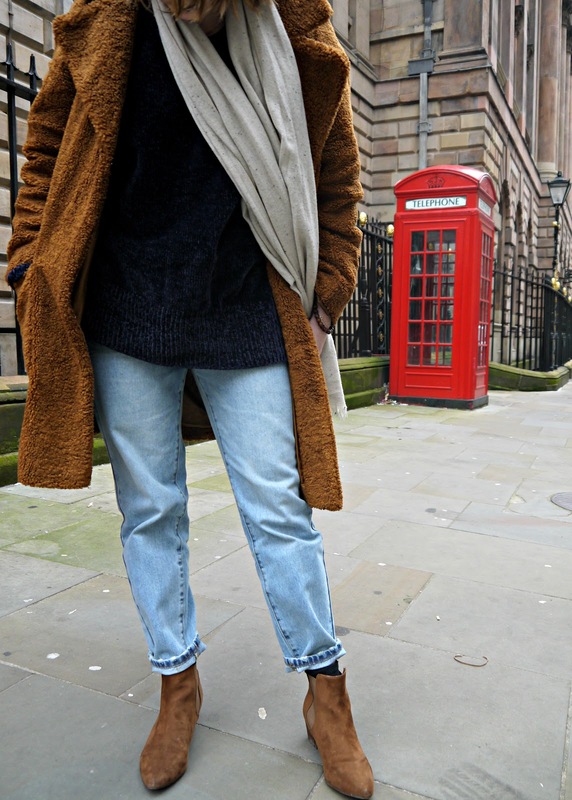 Based around a pair of ridiculously comfy girlfriend jeans - I've been wearing a variation of this slouchy, oversized attire for the past few months. if you'd have told me this earlier last year, i'd have laughed! I've always been a through and through black, skinny jeans gal! 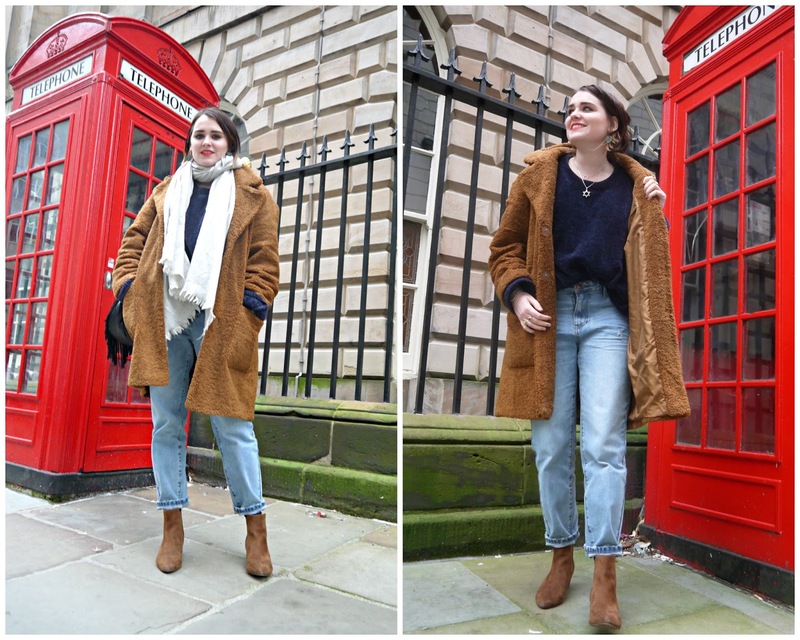 Paired with brown, heeled Chelsea boots from Next, a navy oversized chenille jumper (and white, mottled scarf) from Zara as well as my prized oversized teddy coat from Warehouse - I feel comfy and casual whilst still looking presentable! This really has been my go-to look of now that makes me feel confident and happy - hopefully that translates into the pics, despite me being a total newbie.